As you can see my recipes have gotten fewer and shorter 🙂 My time to blog has definitely taken a back seat with the birth of Charlee. However, it does not mean that my passion for healthy meals has gone to the wayside. 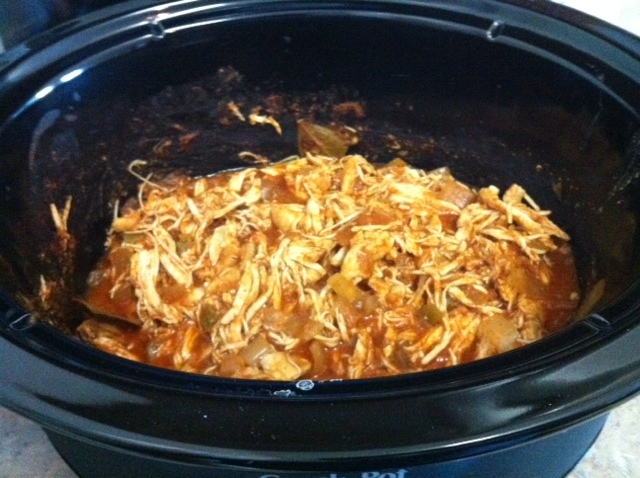 I now look for super convenient, healthy fixins…the crock pot has become my best friend. Therefore, when my pal and mom of twins shared this “way-to-easy-to-be-true” recipe, I knew I had to try. It has now become a weekly staple and I love to pass along to other busy moms and dads. Place chicken in crock pot. Cover with seasoning and salsa. Set crock pot on low and cook for about 6 hours. The chicken will just fall about when done. Cheers to healthy and convenient meals!